Maybe a bug, but I've noticed this twice during my setting up... and testing my configuration. 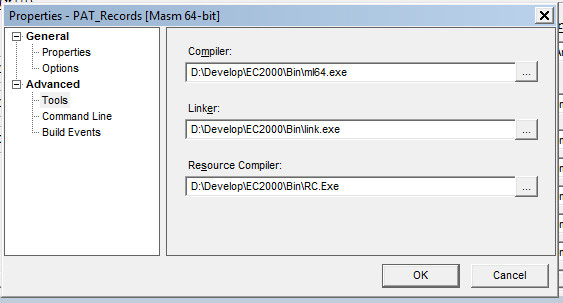 Well, it seems that the "D:\Develop\EC2000\Lib64" folder does not exist and I guess it is a configuration error (have a look at the Masm64.cfg file). 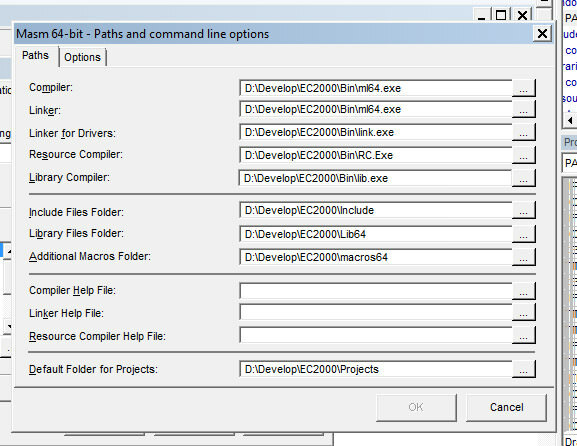 For 64 bit projects the 64-bit libraries are in the "\EasyCode\Lib\x64" folder, so in the Masm64.cfg configuration the "Library files folder" entry must point to the path where you have the EasyCode folder ("..\EasyCode\Lib\x64"). I have the older 32bit version of Easycode (Easycode folder) running as well as the 64bit version (EC2000 folder ). EC2000 64 bit seems to be defaulting to the Easycode 32 bit folder, whereas in the pics below I've set my options and properties to the EC2000 folder. 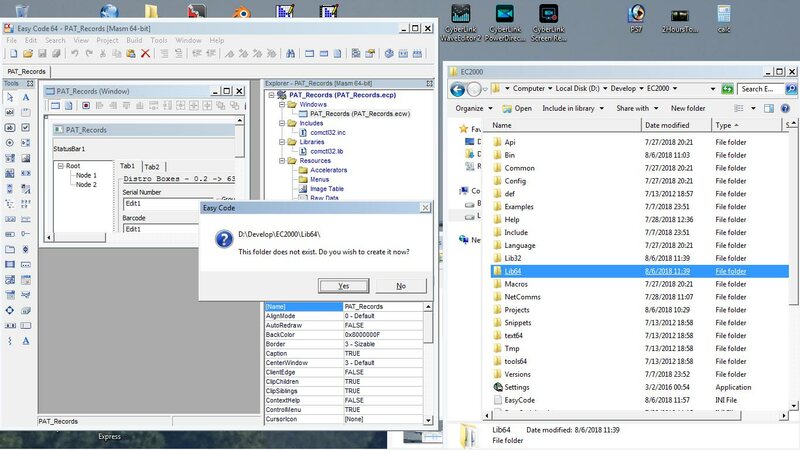 Once I made those folders in the Easycode folder, the problem then asked for a Lib folder in the EC2000 folder..
For the 64-bit Masm configuration (Masm64.cfg configuration file), the Include Files Folder and Library Files Folder entries must point, respectively, to \EasyCode\Include\Masm\x64 and \EasyCode\Lib\x64. I was moving things around a bit to have different versions available.